Shell Beach is perfect for a romantic getaway or family vacation. It has two equally charming bedrooms, and one bedroom is exterior access only, for optimal privacy. The harbor view doesn’t hurt either, it’s absolutely gorgeous! You can watch ships go in and out of the harbor, and be dazzled as the sunset reflects off the water. 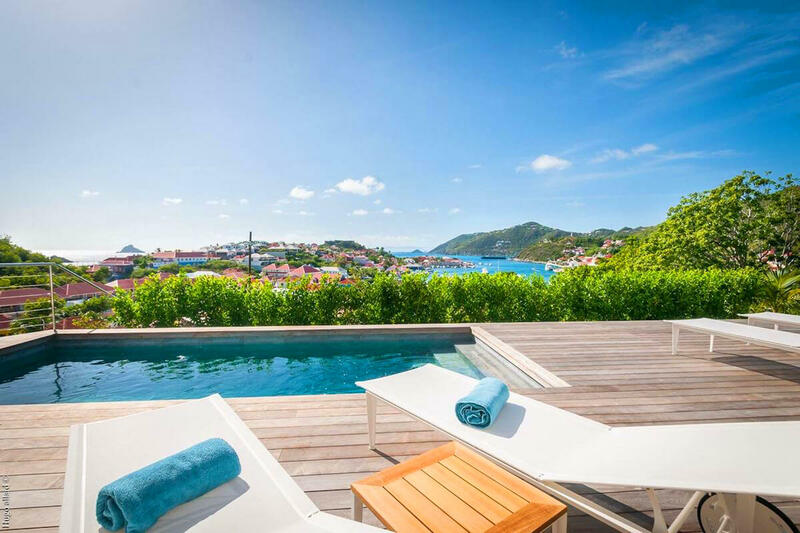 Shell Beach Villa sits a short walk away from the beach with a view of the Gustavia harbor. The villa is near Gustavia’s shops, restaurants, and nightlife, making it a perfect setting for a family vacation or couples’ getaway. The deck wraps the length of the villa, with a private pool at one end. Several sun beds and loungers dot the space, and a dining table sits under the veranda. Inside, entertainment abounds in the living room thanks to an Apple TV, DVD player, and stereo system. The adjacent dining table seats 6, and the modern kitchen features a gas stove and sleek countertops. Each bedroom has a queen-sized bed, his and her closets, and an ensuite bathroom. The bedrooms are on opposite sides of the villa, so guests have total privacy. One bedroom has direct terrace access, and the other bedroom is accessed by a pathway that leads to the terrace. Shell Beach is just a few minutes from Gustavia’s shopping, dining, and airport. It’s namesake beach and Gouverneur Beach are nearby. Shell Beach is a very short walk.